Kristina Bouley holds a Master of Occupational Therapy degree from the University of North Dakota. 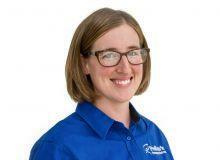 She has over six years of experience in pediatrics, as well as experience in home health care. She is certified in the Therapeutic Listening Program, Beckman Oral Motor, Handwriting Without Tears (Level 1 Tutor), Kinesiotaping, and CPI. She is also an AmTryke Evaluation and Fitting for Therapists Trainer. Kristina specializes in handwriting, sensory processing disorders, early intervention, and autism spectrum disorders.